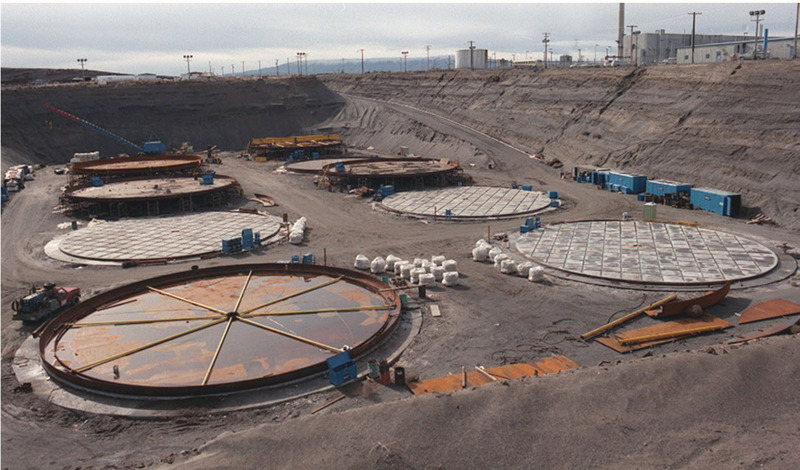 AP tank farm at Hanford, shown under construction in the early-to-mid 1980s. The investigations are part of DOE's Energy Frontier Research Center to accelerate scientific breakthroughs needed to support the nuclear cleanup mission. RICHLAND, Wash. — A more thorough understanding of the chemistry of radioactive waste is key to treating this unwanted byproduct of winning World War II and the Cold War. To accelerate the scientific breakthroughs needed to support the Department of Energy's cleanup mission, four new Energy Frontier Research Centers have been formed. Energy Secretary Moniz announced Monday that up to $40 million dollars will go to fund the four centers for up to four years. DOE's Pacific Northwest National Laboratory will lead one center called IDREAM, which stands for Interfacial Dynamics in Radioactive Environments and Materials. Approximately 300 million liters of highly radioactive wastes are stored in hundreds of underground tanks at the Hanford Site in Washington and the Savannah River Site in South Carolina. These wastes are extremely complicated mixtures of salts and sludges that have been exposed to ionizing radiation for decades. Their chemistry is dominated by interactions at solid-liquid interfaces that are poorly understood. A more detailed understanding of the interfacial processes in radiation environments is needed to support innovation in the processing of these materials for disposal. "Science underpins every mission of the Department of Energy. These new Energy Frontier Research Centers will provide a foundation of basic science for a top priority of DOE - tackling environmental cleanup of hazardous waste from nuclear weapons research and production," said Cherry Murray, director of DOE's Office of Science. "These projects bring together talent and leadership from top scientists to solve problems through scientific discovery." "We defined the science questions that need to be answered first and then brought the right people together who can help answer those questions, so it really is a dream team," said Sue Clark who will lead the Energy Frontier Research Center. Clark is a Battelle fellow at PNNL and a regents professor of chemistry at Washington State University in Pullman. The team is made up of researchers from PNNL, Washington State University, University of Washington, Georgia Institute of Technology, University of Notre Dame, City College of New York and Oak Ridge National Laboratory. The team has expertise in chemistry, chemical engineering, materials science, microscopy and computational modeling. Ultimately, the goal is to understand the impact of radiation on the various materials and constituents in waste tanks and how they age. "If we can understand that aging process, we can possibly reduce the time and expense of characterizing the waste and accelerate its processing for disposal," said Clark. The centers were competitively selected based on a comprehensive merit review process and are expected to begin work in August. "Beyond the important scientific advancements we will make, I am very excited about training the next generation of scientists who will continue tackling these issues over the next 30 to 40 years," said Clark. "In particular, WSU has world-class academic programs in radiochemistry and materials science. PNNL's joint appointment program for faculty and staff will facilitate our collaboration on this important societal challenge." This is the second PNNL-led EFRC. The Center for Molecular Electrocatalysis was established in 2009 to study catalysis for solar energy and fuel cells and renewed in 2014. Since the establishment of the EFRC program by the Department's Office of Science in 2009, the Energy Frontier Research Centers have produced over 7,500 peer-reviewed scientific publications and have helped lay the scientific groundwork for fundamental advances in solar energy, electrical energy storage, carbon capture and sequestration, materials and chemistry by design, biosciences and materials in extreme environments.